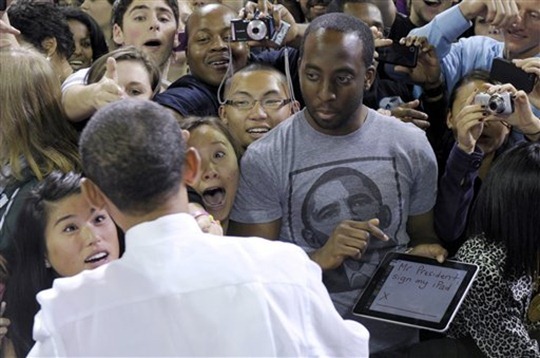 This is our 2nd Obama-related post of the day, but hey: it’s not everyday you see the American president sign an iPad, right? At a rally in Seattle at the University of Washington, the President signed his autograph on my iPad using the Adobe Ideas app. Generally, the President doesn’t sign autographs along the ropeline because pens can be used as a weapon, so I thought I would try to hand him my iPad with a message on it saying, "Mr. President, sign my iPad". It was kinda funny because he looked up and gave me a big grin afterwards as if he thought it was pretty cool too. 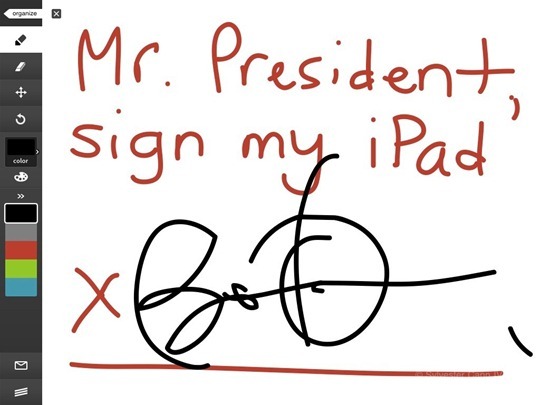 This has to be the first time the iPad has received a Presidential autograph on the ropeline. 4. If you see the actual autograph, notice how there is a small black mark in the lower right corner, I had to give him a demo on how it works.